When you look at a trading chart, a genuine breakout from you trend channel means that channel is now defunct. You need to discard it. To verify that the breakout truly ended the trend, you need to evaluate it in the context of the general volatility characteristics of the security itself. By examining conditions at the time of the breakout, you may gather clues as to what the price is likely to do next. As a general rule, a breakout that occurs in the course of an orderly (low volatility) trend is more meaningful than a breakout that occurs in a disorderly (high volatility) trend. Volatility refers to the extent of variation away from a central reference point (like an average). In the first chart, the security is orderly — prices line up neatly within the channel. The breakout is obvious. In the second channel, the security isn’t so tidy — prices jump around a lot. The breakout bar is exactly the same size as the orderly channel breakout bar, but in the disorderly price series, you can’t be sure that it’s authentic. If your security generates a lot of false breakouts and they make you nervous, find another security. A number of vendors offer software you can use to scan a collection of securities for those which are low volatility and therefore less likely to generate a lot of false breakouts. When a price series morphs from an orderly to a disorderly mode, the transformation is almost always accompanied by a breakout and a change in volume. Weirdly, a shift the other way also foreshadows a breakout. When prices shift from disorderly to orderly, the sharp decrease in volatility warns you that a breakout is impending; buyers and sellers alike don’t know what to do, so they do nothing. On the day of the breakout and in the day or two following, you see a big increase in volume. You also want to know the context of the breakout in terms of where the prices were located within the channel just before the breakout. The usual breakout is in the opposite direction of the prevailing trend. 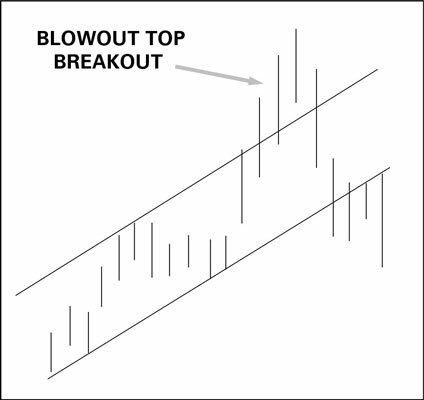 This figure illustrates an upside breakout in an uptrend. It’s still a breakout, and you should expect that it still marks a change in the trend even though it is in the same direction. Although it may simply signal a steepening of the trend as the crowd develops enthusiasm for the security, it can also occur near the end of a trend. It is sometimes called a blowout (or blowoff) top or bottom.